When people find the right watch, they want it to last forever. That’s why most watch-owners would prefer to repair rather than replace their watches. That’s why watches often become heirlooms. And that’s why so many people have tan lines around their wrists. Do you own a watch you love? You should. We are the only authorized Luminox dealer in Dane County. Luminox watches are the gold standard among U.S. Navy SEALs and U.S. Air Force nighttime stealth jet pilots. These high-performance sports watches offer cutting-edge, self-powered illumination that makes them easily readable in any light conditions. We are also proud to carry Skagen watches. In keeping with the minimalist design style of the Danish, Skagen watches are sleek and simple, with clean lines and neutral tones—soft blues, browns, silver, and gold. They are an ideal choice for casual-to-formal, day-to-night wear. 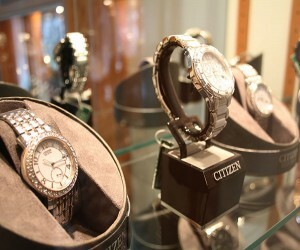 Our Citizen watches are truly the fusion of technology and beauty. From professional dive watches, to yachting and aviation watches, to voice-recognition watches, and watches that are powered by both natural and artificial light sources, Citizen is known for being on the cutting edge of timekeeping. When you find the right watch, you won’t want to let it go. We can help with both ends of the process. Pairing you with a watch you love as well as providing first aid on your watch when you need it. We do repairs, battery replacements, and complete overhaul of watches, whether you purchased yours from our store or not. At Capital City Coins and Jewelry, we’ll help you find a watch to love, and we’ll keep it ticking for you for years—if not generations—to come.